Investigating Black students’ disinclination to consider and attend historically Black colleges and universities (HBCUs). Research on historically Black colleges and universities (HBCUs) has documented the positive impact of these institutions on Black students. Such research has shown that Blacks experience positive academic and social outcomes and a disproportionate number of students who graduate from HBCUs attend graduate or professional schools. Notwithstanding, over the years, there has been an increase in the number of Blacks attending predominantly White institutions (PWIs) over HBCUs. 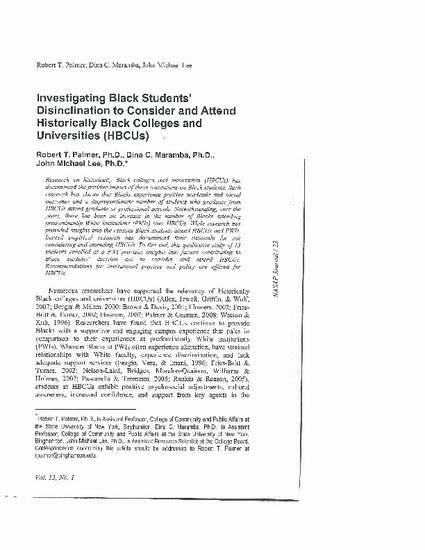 While research has provided insight into the reasons Black students attend HBCUs and PWIs, limited empirical research has documented their rationale for not considering and attending HBCUs. To this end, this qualitative study of 13 students enrolled at a PWI provides insight into factors contributing to Black students’ decision not to consider and attend HBCUs. Recommendations for institutional practice and policy are offered for HBCUs.